After blogging our about the Garden Cafe where deaf/mutes are employed, I would like to introduce to you the restaurant that garnered an award of being the Bohol’s Best Restaurant on the year 2012, Gerarda’s. This is a classic Filipino-Chinese family restaurant which caters mouth watering foods with a twist. On my first visit in Bohol, this was the restaurant which most of the people recommend since its owners were originally from Dumaguete. I tell you ladies and gentlemen that your Bohol experience won’t be complete without tasting this fammous Dinakdakan in the city. This is slightly different from the traditional dinakdakan because instead of using roasted goat meat’s, they used roasted pork belly. The big chunks of tomatoes and onions added a good taste on the course. Aside from mayonnaise, calamansi, ginger and other spices, they used coconut milk to make the sauce creamy. I am not fond of eating chicken in restaurants because pork belly and ribs are always my favorite. When we asked the waitress if what other specialty can they recommend and they pointed the buttered chicken which has a “like thumb” icon on its side. It was a good idea to try out their buttered chicken because it is perfect. It didn’t look deep fried too much and it is very soft and delicious that would make you want more of it. 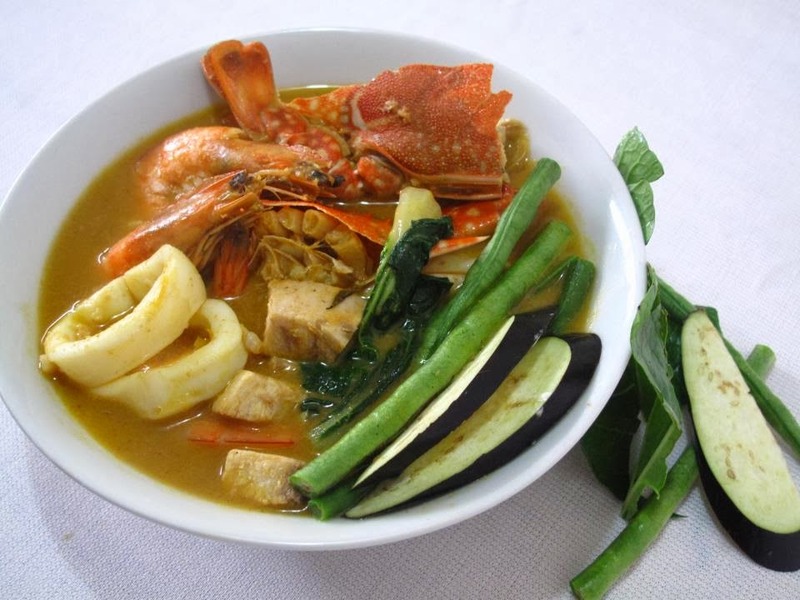 Another food that is highly recommended is their Seafood kare-kare. A seafood and vegetables in peanut sauce. The difference from the traditional kare-kare is that has aligue in the dish and it’s sauce isn’t thick but more broth-like. And again, it is delicious because it has certainly a twist. The price range is from 115 to 500 pesos which is very affordable for family or barkada eat more. The service is very fast and the crew is very approachable. They are open from Monday to Sunday on these hours, 10:00 am – 2:00 pm and 5:00 – 10:00 pm. That seafood kare-kare! I wish I could visit Bohol soon, got to put this restau on my bucketlist! Wow! The last time I went to Bohol was 3 years ago. I wanna go back there so bad. Would love to visit this restaurant too. Curious with Dinakdakan.